F2 could then be removed, or you could make it private and use it for test topics as only the admin would see it. I do want only one forum (Food Chemistry at FutureBeacon.com ). That's right, when you are logged in, if you go to the topic you want to move, there is a "post reply" button at the top and at the bottom of the page, the post reply box at the bottom of the page has 3 boxes on the right side of it, the last one is a hammer icon, click that box and a drop down menu list will appear. The posts should now be in F1 and F2 will say something like there are no posts in this forum. I did as you said and it went through the paces you described but all that happened was the option to login form https://www.futurebeacon.com/forum/viewforum.php?f=2 disappeared. What browser do you use to get the info to the right in inspect element? 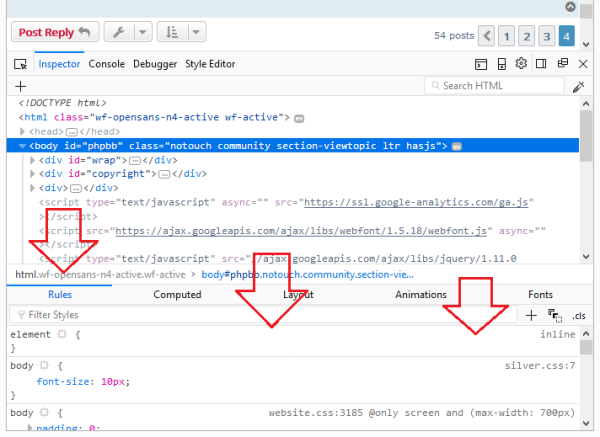 one of the main purposes of the inspect element is to see the css that controls it different sections of the web page. I do believe that any and all of the inspectors no matter the browser, would have that available. YOu probably just dont have yours setup properly to show it. Is this html webpage a file like any other webpage on my site that I can download to inspect? Is this html page in any folder in the forum? Does anybody know? When I get indoors I'll add a screen shot of how the inspector in my browser looks, what browser are you using? Are you using a pc/laptop? The html you're seeing is made up using all the parts located in Prosilver's template folder. Do you have your firefox window open full screen? or minimized? If i minimize the screen, it looks similar to yours, but just under the last line is the CSS window box. Does yours not have that box ? i've checked through the settings to see if there is an option to hide / unhide the box but can't see one. and the answer to your question about the html pages is yes and no. phpbb does not have normal html pages . it is a dynamic set of scripts and templates that create complete web pages on the fly depending on what you click on. the yes part of the answer is because if you look in your ftp you will see the folder named styles, in there is a folder named prosilver and in there is a folder named templates and a folder named theme. in the theme folder are all the css files and images that the board uses. you download whatever relevant html and/or css files that you want to edit and open them in a text editor only. do not use dreamweaver or anything like that, just a good text editor. the one that comes with your mac is not good. get a good text editor like notepad++ or edit pad lite or whatever works with macs. Are the templates placed in MySQL and modified by member posts? Is there a document that explains these sequences? no, the templates are only for the layout and overall look of the pages. only the data ( post text etc. ) is placed and kept in the database. (mysql is just a type of database ). when you click on a link to view a post the php script will call the correct html templates to create the view post page. it will then call the data needed for the post you clicked on and insert it into the proper places in the html files and display it in your browser. that exact web page does not exist anywhere as a complete web page except in your browser while you are viewing it ( and in the browser cache for a while ). when you click on the next post to read it, the same thing happens again. a phpbb page consists of the overall_header.html file and the overall_footer.html file and the html template for whatever page you are trying to view in between those two. read the code for your template files. not the source code. open the actual html files from your copy of your style that you have on your computer. of course. phpbb is a set of php scripts .php files. look at the urls of any page in phpbb. it is a php file. as I said above. those php files call the proper templates and the proper data from the database and compiles them on the fly and presents the final product to your browser . it uses a database, it could be mysql or postgres or some other type of database. most of the time it will be mysql since that is the type of database that most hosts provide as default for their clients.